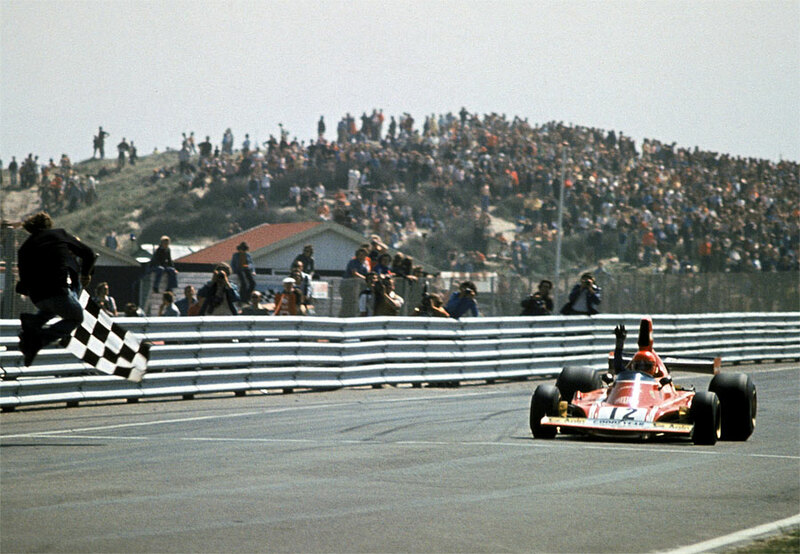 Niki Lauda proved that 12 cylinders are better than eight - at least on the high-speed Zandvoort circuit - by romping to victory ahead of his Ferrari team-mate Clay Regazzoni at the Dutch Grand Prix. The flat-12 engine in the back of Lauda's Ferrari powered him to victory with an average speed of 114.6mph, and he crossed the line 30 seconds ahead of his nearest non-Ferrari rival, Emerson Fittipaldi. The only cars to split the two Ferrari's all afternoon were Mike Hailwood's McLaren and Jody Scheckter's Tyrrell at the start, but both were quickly dealt with by Regazzoni at the end of Zandvoort's long straight. Further down the field James Hunt had qualified a promising sixth in the Hesketh but a collision with Tom Pryce's Shadow on the second lap put an end to his charge. Fittipaldi worked his way through the field after a poor start and passed Hailwood, who was driving a similar McLaren, for third. The win moved Lauda within one point of Fittipaldi in the drivers' championship and the resurgence in Ferrari's form led some commentators to write off the rest of the field - the significant majority of which were using the less powerful but lighter and more efficient Cosworth DFV V8. Pat Mennem of the Mirror wrote: "The 12-cylinder Ferraris never missed a beat and were so much faster than the opposition they must have sounded the death knell for the Cosworth Ford V8 engine which powered most of the opposition."